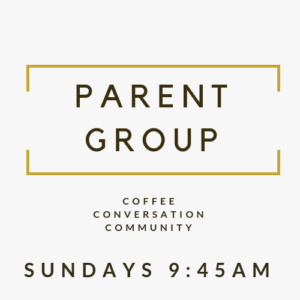 On Sunday, grab a cup of coffee and settle into the beautiful room that looks out into the courtyard for discussion with some people in the same season of life as you. 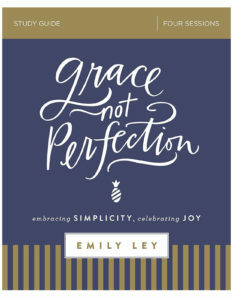 Right now the parent group is discussing “Grace not Perfection” by Emily Ley. There is no required reading outside of the group and you can join the group at any time. With a focus on faith, Emily reminds readers that God abundantly pours out grace on us - and that surely we can extend grace to ourselves. Are you ready for a new way of seeing your time? Learn to live a little more simply. Hold yourself and those you love to a more life-giving standard in Grace Not Perfection, and allow that grace to seep into your days, your family, and your heart. 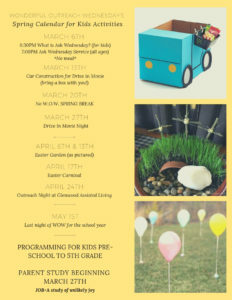 Supervised Nursery available 8 to 12 each Sunday for children up to age five. Check the Welcome Center for Guest Name Tags or to request a permanent Name Tag for yourself. Permanent Name tags are available for everyone. Please wear yours so that others can get to know you. To request a permanent nametag, indicate that on your attendance sheet or sign up at the Welcome Center. Temporary nametags are also available at the Welcome Center. Note that new nametags are in alphabetical order.